“I don’t know why you don’t just quit.” There probably isn’t a recovering drug user or current drug user who hasn’t heard this from a friend or family member. For those who have never been addicted to drugs, whether illicit or legally prescribed drugs like Percocet, it’s often difficult to understand what it’s like for the addict. From the outside, they see the damage that drug use has done to the user’s body and their life. They know the many ways in which their drug using behavior has harmed their loved ones. Seeing all of that, they have difficulty understanding why the addict doesn’t just stop. The primary problem is that family and friends don’t realize the power of drug dependence. In the case of Percocet, we are dealing with an opioid. Opioids, derived in some way or other from opium, work by blocking pain receptors in the brain. They don’t treat the cause of the pain. They only prevent the person from feeling the pain. So far, so good. Opioids also slow down activity in the digestive tract, sometimes resulting in constipation. Less fun. However, opioids also have an additional, more dangerous and powerfully addictive effect on the brain. They activate the reward pathway. The reward pathway is a series of processes in the brain which results in the release of dopamine and serotonin. These neurochemicals produce a feeling of pleasure. The purpose of the reward pathway is to encourage the repetition of behaviors which are good for the body. It is common, for example, for runners to experience what is described as a runner’s high. This is the brain’s way of encouraging the person to do it again. Opioids, however, hijack the reward pathway. Without doing anything good for the body, the person experiences the pleasure produced by the reward pathway. This experience of pleasure is often greater than the person would normally experience from behaviors that activate the reward pathway. This is called a high. It is no wonder, therefore, that the opioids are known to be very addictive and why addicts are often so reluctant to quit. What Can Family and Friends Expect During Withdrawal? Despite all of this, it is still possible to help a person move toward recovery and make a decision to quit using Percocet. The family and friends of the Percocet addict who decides to quit using should be prepared for what will happen. The more serious the addict’s abuse of Percocet was, the more serious the symptoms of withdrawal will be. While using Percocet, the addict’s brain reduced the amount of serotonin and dopamine available in the brain and the number of receptors for these neurochemicals. Therefore, during the withdrawal period, the individual may also have only a very limited ability to experience pleasure. Behaviors which previously resulted in an experience of pleasure may feel empty. This is one of the major overall obstacles that victims of Percocet abuse experience during withdrawal. Symptoms of Percocet withdrawal will begin within hours of the last dose. Starting on the 3rd day, the addict will also start to experience shaking and cramps. After about a week, the physical symptoms will begin to ease, but the psychological symptoms will become more severe. Family and friends must be ready for the onset of psychological symptoms of withdrawal from Percocet. Anxiety and depression, resulting from decreases in the brain’s natural ability to experience pleasure, can be very discouraging for the recovering Percocet abuser. They may express a desire or an intention to go back to using. The former user will likely feel as if they are setting out on a life without any joy or pleasure in it. It is important that these psychological symptoms be closely monitored. It is at this point when the recovering addict will be most in need of the support and encouragement of family and friends. 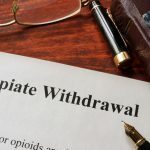 Because the Percocet withdrawal symptoms can be severe, it is sometimes better to withdraw slowly, tapering off the amount of use rather than stopping suddenly. The risk here is that the victim of addiction to Percocet may return to using at previous levels as symptoms of withdrawal begin to appear. Under medical supervision, there are also some drugs available which may reduce or limit the symptoms of withdrawal. Of course, these medications also carry their own addictive risk, so the decision to use them must not be taken lightly. Clonidine may reduce vomiting or some other physical symptoms. Suboxone can provide relief from the symptoms of Percocet withdrawal, especially the cravings, without providing quite the same ‘high’ that users receive from Percocet. Naltrexone blocks receptors in the brain that bind to Percocet, reducing or limiting the drug’s ability to provide pleasure. It can also help restore the brain’s natural levels of dopamine and serotonin and the availability of receptors for dopamine and serotonin. None of this is meant to discourage family and friends of a person addicted to Percocet. It is meant encourage and support them in choosing to recover by giving them the information they need to prepare. Untreated Percocet addiction only gets worse and worse as the brain adapts to its presence. Please do not surrender your hope that the Percocet addict will be able to recover successfully. Yes, the process is difficult, painful, even miserable, but the ongoing abuse of Percocet is more destructive. Be strong, and stand ready to help. The one you love will need your help throughout the process of Percocet withdrawal and recovery. Why Leave Town for Addiction Treatment?